Rajasthan B.Ed Admission Form (राजस्थान बीएड आवेदन फॉर्म) 2017: Maharashi Dayanand Sarswati University is going to conduct the Rajasthan Pre Teacher Education Test 2017 on 14th May 2017. The aspirants can download the Rajasthan PTET 2017 Application Form from the official website i.e. ptet2017.com. The Rajasthan Pre B.Ed Application Form 2017 released on 20th January 2017. The deadline for the submission of the online form is 25th February 2017(now extended to 21st April 2017). PTET is conducted for the students who want to take admissions in B.Ed. Note that every student must check the eligibility criteria before applying for the application form. Every year Rajasthan PTET is conducted by Narain Vyas University, Jodhpur but from last year MDSU Ajmer conducts this exam. The Pre-teacher Education test is for the candidate who wants to shape their future as a teacher. 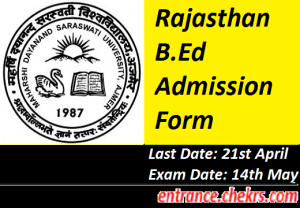 All the necessary details for Rajasthan B.Ed Application Form 2017 is given below, you can check the procedure to apply online Raj Pre B.Ed Admission Test. RTET or Rajasthan Teacher Education Test is conducted by Rajasthan Board of Secondary Education for the teachers in Rajasthan. It is conducted twice a year. The Maharishi Dayanand Saraswati University is going to conduct the pre-teacher education Test for the aspirants seeking for the admission in B.Ed. courses in Rajasthan state. The exam is going to held on 14th May 2017 and the Rajasthan Pre B.Ed Application Form 2017 will commences from the 20th January 2017. The deadline for the application form is 25th February 2017(now extended to 21st April 2017). The aspirants can submit their application form online by following the steps given below. First step is to pay the application fee for getting a token number. After getting the token number aspirant can start filling the application form. Fill all the details correctly and carefully. Now attach scanned copies of document, photograph and signature. Now submit the application form by clicking on submit button. Take a printout of the application form for future purposes. Note: The date for the submission was 25th February 2017 but according to the official notification which released on 20th march 2017, the last date for the submission of the Rajasthan PTET Application Form 2017 is extended to 21st of April 2017 and the last date for the submission of the application fee receipt is 24th April 2017. Aspirants must have passed their graduation or post-graduation from any stream. Aspirants who have done regular distance or open degree from any recognized university can also apply for this exam. There is a relaxation of 5% marks in the degree qualification for the categories of SC/ST/OBC. Aspirants must have completed 21 years before the registration date. Aspirants have to pay an examination fee of Rs.500 and Rs.10 will be charged by the e-mitra center. The syllabus for the Rajasthan PTET 2017 is divided into four sections the exam questions will be selected only from these four sections. The sections are given below. Aspirants will be selected on the basis of marks obtained by them in the Rajasthan PTET Exam 2017 and they will be allotted seats for B.Ed. courses in the counselling process. The pre teacher education test is conducted for the students who want to take admission in the B.Ed. Courses. Aspirants who interested in taking admission in B.Ed. 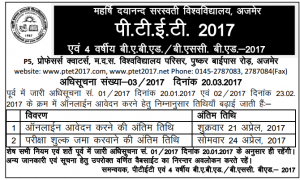 can submit Rajasthan PTET 2017 Application Form from 20th January 2017. The deadline for the registration form is 21st April 2017 and the exam will be conducted ion 14th May 2017. Students who are interested can apply for the application form but first, they must check the eligibility criteria for the submission of application form. For feedback and more queries regarding the Rajasthan B.Ed Admission Form 2017, you can contact us by commenting in the comment section given below.